SAN DIEGO -- Ping pong: It's a game celebrated in one of the original video games in the '70s, and dominated by Forrest Gump. 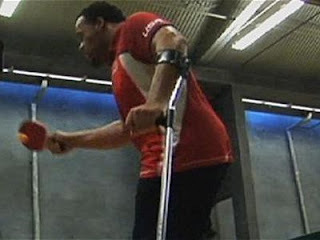 But for 33-year-old amputee Daryl Sterling Jr., (pictured) the sport has opened doors to a Narnia-like world of wonderment he never knew existed. The San Diego computer engineer treks the globe playing in international para table tennis tournaments. "There are big stadiums ... indoor blimps flying around dropping ping pong balls on people, cheerleaders," Sterling described of a tourney in Germany, "It's a sporting event." After putting in Kobe-like work the last 6 years, Sterling cracked the top 40 in the ITTF Para Table Tennis world rankings. Under coach Stellan Bengtsson, the '71 World Champion, Sterling's dropped more than 50 pounds and developed arms that make you wonder if his paddle is actually a Shake Weight. His next goal is represent the U.S. in the 2012 London Paralympic Games. He says it's been quite a journey since a car smashed into him when he was 8 years old, robbing him of his right leg. "I never thought I'd be able to play against able-bodied people in any sport," Sterling said. "With table tennis, I realize I can."